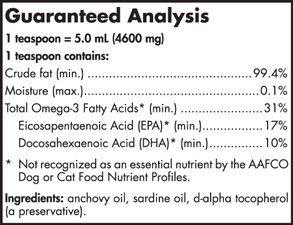 Nordic Naturals® Omega-3 Pet for Cats and Small Breed Dogs is an excellent source of the omega-3 essential fatty acids EPA and DHA. It is an essential supplement to promote optimal pet health and wellness at home. Our Omega-3 Pet oil is derived exclusively from wild anchovies and sardines sustainably sourced from the South Pacific and Atlantic oceans. Nordic Naturals was inspired to launch our Nordic Pet® Collection to provide dog and cat companions with the same exceptional quality oils we produce for humans, so they too can experience the benefits of our fish oils.